New! 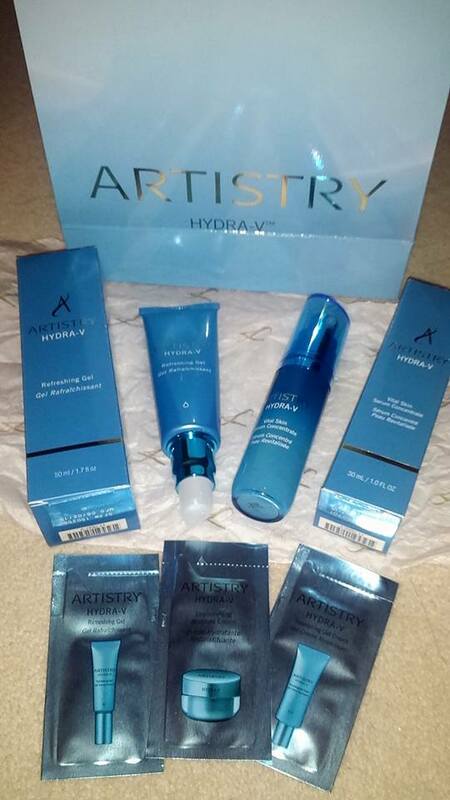 Artistry Hydra-V Range... tackling my dehydrated skin. My skin hasn’t been the best of late so when an opportunity arose to go and view an information session on a hydrating range from brand Artistry, I thought to myself….why now?! All my concerns over the past few years in relation to my skin have been about spots, I never stopped and thought if my skin was looking slightly dull or breaking out because it didn’t have enough moisture in it. Every spot product I use, I would use all over, I would lash it onto my skin without a moments worry and then I wondered why my skin was looking so dry/dehydrated at points. Now just so we are super clear….I am not in any way shape or form a skincare expert, I have a serious love for the brand Ziaja we all know that, there’s not a day in the week where I don’t have a body lotion, body butter or hand cream from the brand on my skin but that would be the only brand I have a little knowledge on. I do understand that there is a big difference between dry and dehydrated skin so please if you are worried that you are using the wrong products on your skin, speak with an expert in a salon or a pharmacy, I cannot tell you what’s right for you. Artistry is a brand I have reviewed before but this was with cosmetics, I actually wasn’t aware that Artistry even had skincare as it’s not a brand I know too much about. I was really interested to see what this new hydra-v range is all about and would it be something I’d consider using. As I have been using both of these products together, I cannot make a judgement on them as individually working on my skin but I can tell you about the results and thoughts I’ve been having on the range itself. So first up is the serum. I cleanse my face and then tone it with Glo Therapeutics products at the moment and then I put the serum on. It’s very light in texture and once on the skin, it feels like it pulls the skin together. I don’t know if that’s the right way to describe it but it’s a real fresh feeling and the scent isn’t overpowering at all. I let that sink into my skin before I put on the moisturiser. Usually I will potter around and make tea to really like it sink in and not mix it up with the next product. The moisturiser is again very light, a good scent and leaves my skin feeling super fresh, almost wet as opposed to greasy, oily or sticky. I again leave this to apply and some days I have found I don’t feel the need to wear a primer but I think better most days and protect my skin again. I am very lucky that the moisturiser I was given is suitable for oily skin so it’s helping to keep the oil at bay during the day. My overall thoughts of these products are I really like them. Now I have to say it would take a serious change in my skin for me to pay €100 for two face products. 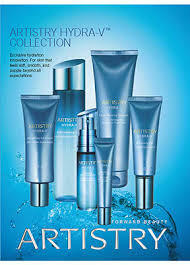 I am enjoying using them, my skin feels much better but as yet I am not seeing a huge difference. I think to be fair to the products I am only using them three weeks, I will continue to use them fully until they are gone and I have also relooked at my diet and increased with my water intake each day so I really am trying to get rid of these dehydration lines on my forehead which I hate so much! The packaging is lovely and fresh, I quite like that the serum is in a beautiful glass bottle as it looks quite luxurious but for right now I will say yes, Artistry Hydra-V is a beautiful range, yes it is making my skin feel wonderful on a daily basis and yes I am starting to see signs of it tackling my skin issues so it’s a fairly committed thumbs up from me. It’s always interesting as the weather changes that you see it reflected on your skin. We really need to prepare for the winter and although a lot of people would associate dehydration with summer it’s clear that my skin needs water all the time.